This album is easily the least Islands-y of Nick Thorburn’s career. Gone are the big, sweeping production values, replaced by straight-up live recording and an emphasis on the lyrics. He seems to acknowledge this departure with the albums opening line, “Open up your door to me, and let me in.” It took a few knocks, but eventually I did open up that door, and I was pleasantly surprised. The band began working on the album on Valentine’s Day 2011, so it seems appropriate that it is released today, exactly one year later. If you’re a fan of Islands, you will be happy to hear that Thorburns voice remains the constant tying this work to their previous efforts. All of their works have been intimate, but on A Sleep And A Forgetting you really feel like you’re sitting in a room with the band as they pour their hearts out to you. The song has that late 50’s R&B feel that the band have been exploring on their doom wop kick. Like many of the tunes on this record, it never boils over. Rather it simmers at a steady rate and let’s the story carry you through instead of the music, which Islands has sometimes relied on in the past. “No Crying” feels like a song that could have been left over from Nick’s sojourn with Mister Heavenly (underrated album as far as I’m concerned). It has undertones of reggae and tropical music, with Thorburn doing his best Roy Orbison impression. The delivery of the line “I walked right in, listening. Got so close you’d think I’d been, haunted by the teary eye” is glorious. Far better than mere words can do justice. 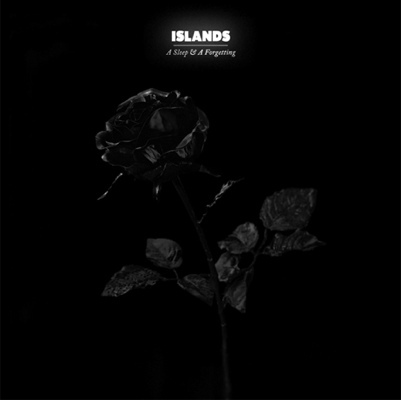 If you’re a fan of Islands, I don’t think you’ll be disappointed by A Sleep And A Forgetting. It may take a few listens, but it’s definitely a grower. Just know that if you’re expecting something like Arm’s Way, you’re not gonna like it. If you aren’t a fan yet, this could be a good place to jump in. It seems like a reinvention of the band at a basic level. There is a tour supporting this record, which will be stopping here in Chicago on March 1 at Lincoln Hall. Pingback: Islands at Empty Bottle 10/14/13 | Music. Defined. Pingback: Top 25 Albums Of The First Half Of 2012 « Music. Defined.